Nobody ever has to caution Tampa Bay Lightning forward Tyler Johnson about taking things for granted. After all, the Spokane native – all 5-foot-8 of him — wasn’t merely overlooked in the NHL draft, but got through 10 rounds of the Western Hockey League’s Bantam Draft as a 15-year old before finally being picked. 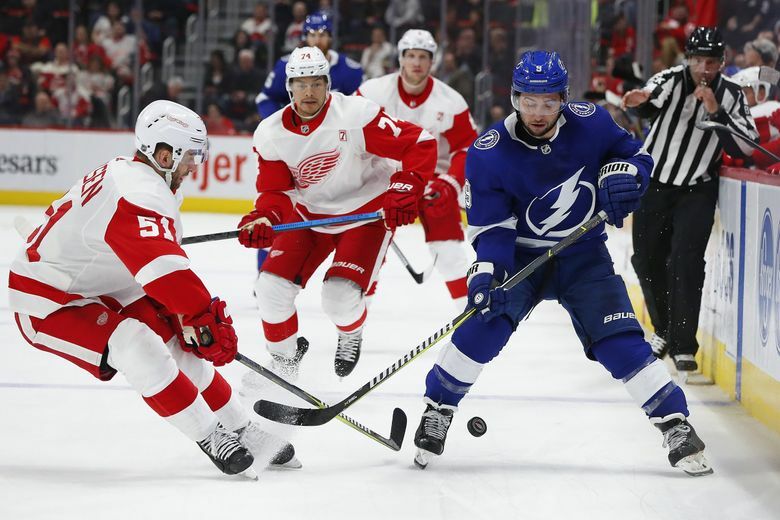 The previous night, Johnson deflected home a go-ahead third period goal in Detroit in an eventual 5-4 win over the Red Wings after the Lightning had once trailed 3-0. It guaranteed Tampa Bay a second straight season of at least 54 wins, only the fourth team in history to do that. And it kept them paced for bigger history, like matching the league record of 62 victories by the Red Wings from 1995-96. Heck, after beating the defending Stanley Cup champion Washington Capitals 6-3 on Saturday, with Johnson scoring again and adding an assist, the Lightning still have a shot at – though it would require a Herculean run — the NHL record of 132 points set by the 1976-77 Montreal Canadiens. Tampa Bay sits 55-13-4 and at 114 points with 10 games to play. They’ll beat Detroit’s wins record by going 8-2 and tie Montreal’s points mark with a 9-1 stretch. Their current season-long pace indeed does have them finishing with a record 63 wins, though they’re slightly off the points mark at a 130 clip. Still, this is regular season we’re talking about. Nobody, especially in Tampa Bay’s dressing room, is foolish enough to argue the Lightning should be considered the greatest team of all-time if they break those records. For one, they’ll play two games more than that Montreal squad – which went 60-8-12 – and already have the benefit of 12 extra points gleaned off overtimes and shootouts that didn’t exist for the 1970s Canadiens or 1990s Red Wings . More importantly, there’s the big reason nobody compares those Canadiens and Red Wings teams when it comes to all-time greatness – despite both being coached two decades apart by the legendary Scotty Bowman. You see, Montreal went on to win the Stanley Cup that year with a 12-2 playoff record and finals sweep. Detroit? They got bounced in the conference final, much like baseball’s record-setting 116-win Mariners losing the 2001 American League Championship Series. So, the Lightning get that they haven’t accomplished anything yet. In fact, no Presidents’ Trophy winner for the league’s top regular season record has claimed the Cup since the 2012-13 Blackhawks. Only three have captured a title this millennium. Last year, the Lightning finished No. 2 overall with 113 points, but neither they nor regular season champion Nashville won the Cup. Instead, the Lightning bowed out to Washington in the seventh game of the Eastern Conference final on home ice. If the Lightning ever needed a reminder the playoffs are a different animal, they have the captain of those mid-1990s Red Wings in their own front office in senior advisor Steve Yzerman. It was a personal phone call from then-Lightning general manager Yzerman during his final season with Spokane in 2010-11 that convinced Johnson to sign with Tampa Bay as a free agent. Though Johnson had won a Memorial Cup his first year with the Chiefs in 2007-08 and a World Junior Hockey Championship for the U.S. in 2010, he’d gone undrafted due to size concerns and was contemplating studying to become an anesthetist. Having played NHL video games as a Spokane teenager, where he often controlled the likeness of 5-foot-8 Lightning legend Martin St. Louis, Johnson never gave up hope. He kept working and made the Calder Cup final with Tampa Bay’s American Hockey League affiliate in 2012-13 – the season in which he also was rewarded with a once-inconceivable NHL debut. Even now, Johnson sometimes can’t believe that he’s in the NHL, on the second season of a seven-year, $35 million contract. Nor that he’s paired on a line with NHL points-leader Nikita Kucherov and has surpassed the 25-goal plateau for the second time. And that’s exactly what he’ll do once this regular season is done and he can get on with the task of bringing the Stanley Cup to Spokane for a celebratory stopover this summer. There are big hopes for the Lightning beyond their record, based on how thoroughly Kucherov, Steve Stamkos, Victor Hedman, Andrei Vasilevskiy – and yes, Johnson, too — have dominated their peers. Their +93 goal differential is nearly double the +50 of the next-closest Calgary Flames. Even though the 1976-77 Canadiens had a record +216 goal differential and the 1995-96 Red Wings were +144, both those tallies were also only about double their closest competitors, which shows the Lightning do compare favorably. Just how favorably has yet to be determined.